Dhaka – Bangladesh has been celebrating the 99th birthday of its independence architect Bangabandhu Sheikh Mujibur Rahman with the government and other socio-political organizations chalking out elaborate programme. Sheikh Mujibur Rahman was born on this day in 1920 in a respected Muslim family in Tungipara of Gopalganj district. His charismatic political leadership throughout his 55 years span of life truly turned him greater than that of his dreams. He became the founding father of the South Asian nation and was titled Bangabandhu (friend of Bengal) at a very young age. 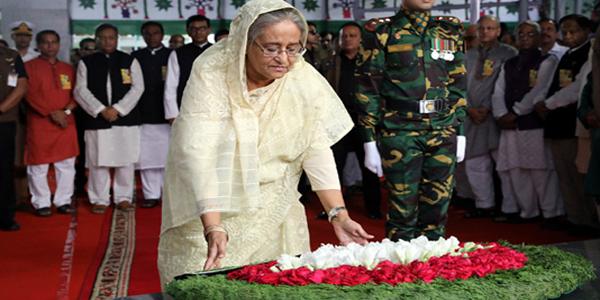 President Abdul Hamid and Prime Minister Sheikh Hasina, the eldest daughter of Bangabandhu, paid glowing respect to the father of the nation in the morning to mark the day. 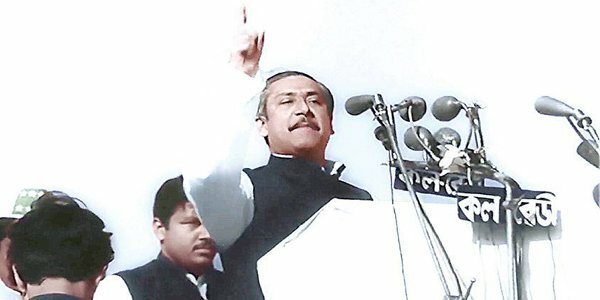 Leaders of the ruling Awami League party, its associate bodies and other cultural organizations also paid tribute to Bangabandhu who was assassinated by a group of disgruntled army officers in 1975, barely four years after Bangladesh won its war of liberation under his leadership with Pakistan. The government also celebrates Bangabandhu’s birthday as National Children’s Day. The theme of this year’s birthday of Bangabandhu and National Children’s Day is “Bangabandhu’s birthday, rinse life of the children with colour”. Bangabandhu was the third among four daughters and two sons of his parents – Sheikh Lutfur Rahman and Saira Khatun. Both the President and the Prime Minister also greeted all children in Bangladesh and other parts of the world. To celebrate the 100th birth anniversary of Father of the Nation Bangabandhu, the government has decided to observe Mujib Year from March 17, 2020 to March 17, 2021. The year will coincide with Bangladesh’s 50th anniversary of independence. President M Abdul Hamid and Prime Minister Sheikh Hasina placed wreaths at the mausoleum of Bangabandhu at Tungipara in Gopalganj in the morning and offer prayers seeking eternal blessing of his departed soul. Hasina also paid homage to the Father of the Nation by placing wreaths at the portrait of Bangabandhu in Dhaka’s Bangabandhu Memorial Museum. The Prime Minister received a replica of the logo of Branding of Gopalganj District at the mausoleum of Bangabandhu at Tungipara in Gopalganj. The Prime Minister is scheduled to inaugurate a book fair and join a photo session with children. She will also visit painting exhibition on ‘Bangabandhu and Bangladesh’. Public hospitals, clinics and healthcare services organizations provided free of cost treatment at outdoor on this day. Improved foods were supplied to all hospitals. Illumination will be ensured at the child wards. Awami League, the party Bangabandhu founded in the late 1940s, will hold a discussion meeting at 3pm on March 18 at Bangabandhu International Conference Centre. Prime Minister Sheikh Hasina will chair the discussion. Newspapers published special supplements and the radio and televisions in both public and private sector aired special programmes highlighting Bangabandhu’s life and his works. 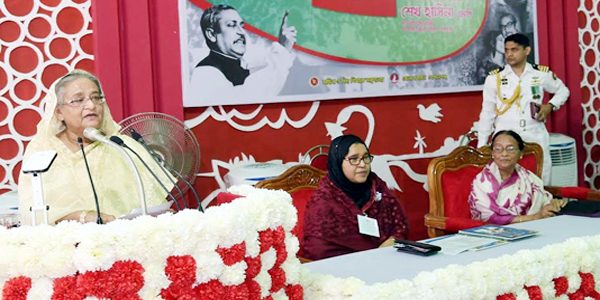 Special prayers were offered in all mosques across the country seeking eternal peace of Bangabandhu and his family members, while prayers will be offered at other places of worships. At the age of seven, Bangabandhu Sheikh Mujib was admitted to Gimadanga Government Primary School and later he studied in Madaripur Islamia High School, Gopalganj Government Pilot School and Gopalganj Mission School. While studying at the secondary level he was attacked by beriberi disease and had to undergo treatment in Kolkata. As a result, there was a gap in his studies for few years. After passing the Matriculation examination in 1942, Sheikh Mujib was admitted to Islamia College in Kolkata getting residential accommodation in famous Baker Hostel. He passed the BA examinations in 1946. After partition of the sub-continent, Mujibur Rahman chose Dhaka as the centre of his political activities and got admitted to the Law Department of Dhaka University. Bangabandhu was elected general secretary of Islamia College Students’ Union in 1946. In 1949, he was elected joint general secretary of Awami Muslim League East Pakistan Unit. In 1953 Bangabandhu became general secretary of the party and in 1954 was elected East Bengal Legislative Assembly member from Jukta Front (Joint alliance). He joined All India Muslim Students Federation in 1940 and in 1943, switched to Bengal Muslim League where he came close to Huseyn Shaheed Suhrawardy. While at Dhaka University, he founded the East Pakistan Muslim Students’ League. 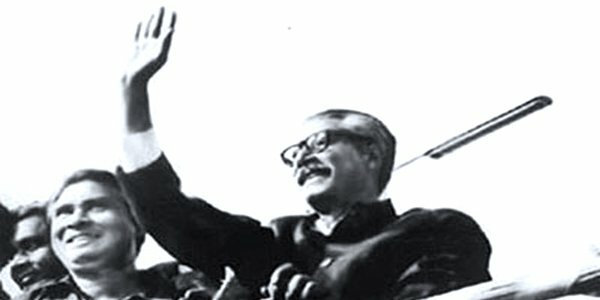 Bangabandhu led students’ strikes and protests when the language discourse of Pakistan first emerged in 1948 and remained active to organize the movements which culminated on February 21, 1952. He left Muslim League to join Suhrawardy and Maulana Bhashani to form the Awami Muslim League. The Father of the Nation became the first Joint Secretary of the party and then the General Secretary in 1953. In the elections of 1954, he was elected at the East Pakistan Legislative Assembly and became the Agricultural Minister. In 1956, Bangabandhu joined a second coalition government as the Commerce and Industries Minister. 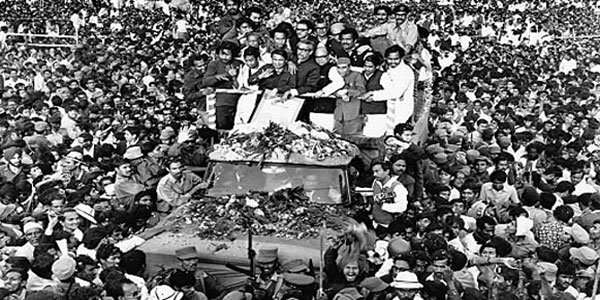 Afraid of public support for Bangabandhu’s 6-point demand, the then Pakistani government arrested him in the Agartala conspiracy case but was forced to release him amidst massive public unrest. On December 5, 1969, he declared that East Pakistan would henceforth be called Bangladesh. In the general elections of Pakistan in 1970, Awami League won a massive majority under Bangabandhu’s Leadership. His party swooped in all but two of East Pakistan’s quota of seats in the National Assembly. The West Pakistani rulers however were completely against his demand for greater autonomy. The then Pakistan President Yahiya Khan delayed the national assembly to bar Awami League from forming the provincial government. In a historic speech at the Racecourse Ground in Dhaka on March 7, 1971, Bangabandhu called for the independence of Bangladesh. Yahiya Khan declared martial law, banned Awami League and ordered to arrest Bangabandhu Sheikh Mujibur Rahman. On April 17 in 1971, the first government of the People’s Republic of Bangladesh was formed in exile and Bangabandhu was made the President of the country in his absence. Soon after that, Muktibahini, the freedom fighters’ force was formed and it started putting up strong resistance against the Pak army, according to state-run Bangladesh Sangbad Sangstha news agency. After nine months of bloody war which killed over 3 millions of unarmed people a new country ‘Bangladesh’ was born under the leadership of Bangabandhu on December 16, 1971. He returned home on January 10 in 1972 and took the charge of reconstructing the war-torn country. 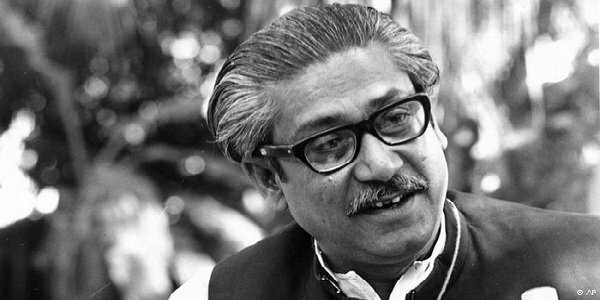 Bangabandhu focused on humanitarian and development assistance from the international community to reconstruct the country. In a bid to bring political stability which was prerequisite to its economic improvement, he worked on his own. Bangabandhu was assassinated on August 15, 1975 by a group of disgruntled army officers at his Dhanmondi home along with most of his family. His two daughters Sheikh Hasina and Sheikh Rehana survived the carnage as they were traveling abroad at this time. Since the re-assumption of state power in 1996, Hasina has been observing the day as the National Children’s Day as Bangabandhu liked to spend time with children on his birthday.